Offering you a complete choice of products which include gm70 hand-held carbon dioxide meter for spot-checking app., gmm111 carbon dioxide module for flow-through measurements, gmm220 carbon dioxide modules for demanding oem applications, gmp231 carbon dioxide module for flow-through measurements, gmw90 combined carbon dioxide & temp & humidity transmitter and vaisala gmt220 carbon dioxide transmitters. The Vaisala CARBOCAP® Hand-Held Carbon Dioxide Meter GM70 is a user-friendly meter for demanding spot measurements in laboratories, greenhouses and mushroom farms. The meter can also be used in HVAC and industrial applications, and as a tool for checking fixed CO2 instruments. The GM70 has a short warm-up time and is ready for use almost immediately. It has a menu-based interface, a graphical LCD display and data logging capability. The optional MI70 Link Windows® software in combination with a USB connection cable provides an easy way to handle data in a PC environment. The GM70 incorporates the advanced Vaisala CARBOCAP® sensor that has unique reference measurement capabilities. The measurement accuracy is not affected by dust, water vapor or most chemicals. The GM70 has a two-year recommended calibration interval. The handle is for hand-held diffusion sampling. The GM70 pump enables pump-aspirated sampling from locations difficult to access otherwise. It is also ideal for comparisons with fixed CO2 transmitters. The GM70 uses the same probes as Vaisala CARBOCAP® Carbon Dioxide Transmitter Series GMT220 and Modules Series GMM220. By plugging different probes into the handle or pump, the user can easily change the measurement range of the GM70. The meter can also be used as a calibration check instrument for Vaisala’s GM20 and series, GMT/M220 fixed CO2 instruments. GMP220 probes can even be adjusted by using the GM70 meter. The GM70 has two probe inputs. Vaisala’s relative humidity and dewpoint probes can also be used simultaneously with CO2 measurement. The Vaisala CARBOCAP® Carbon Dioxide Module GMM111 is designed especially for control of biological processes where high CO2 concentrations are used. It has 3 optional measurement ranges 0 ... 5/10/20 % CO2. The GMM111 is a flow-through model and has barbed connectors for attaching the in and out flow tubes. As the module is not mounted in the chamber, the chamber can be heat sterilized without removing the module. The Vaisala CARBOCAP® CO2 sensors have been proven to be accurate and durable. They have an excellent long-term stability, which decreases maintenance. 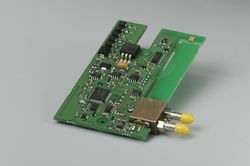 The superior performance of Vaisala CARBOCAP® sensors results largely from the stable reference provided by the electrically tunable Fabry-Perot Interferometer(FPI). The tunable FPI filter measures CO2 absorption, and simultaneously a reference wavelength. This internal reference measurement compensates effectively for any changes in the optical path, such as light source intensity changes and contamination. In the HVAC market, this type of reference measurement is a unique feature to Vaisala CARBOCAP® products. The true internal reference measurement of Vaisala CARBOCAP® CO2 transmitters provides years of stable CO2 measurements. Modules optimized for integration into equipment for greenhouse control, incubators, fermentors, safety alarming and integrated systems. The Vaisala CARBOCAP Carbon Dioxide Module Series GMM220 are designed for Original Equipment Manufacturers (OEM's) requiring carbon dioxide measurements in harsh and demanding applications. The GMM220 series modules incorporate the industrial Vaisala CARBOCAP Sensor. The patented sensor has unique reference measurement capabilities. Its critical parts are made of silicon; this gives the sensor outstanding stability over both time and temperature. Since water vapor, dust, and most chemicals do not affect the measurement, the GMM220 series modules can be used in harsh and humid environments. The GMP220 probes are interchangeable. They can be removed, reattached or replaced at any time - without the need for calibration and adjustment. 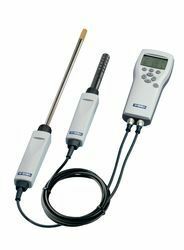 The interchangeable probes make calibration and field service easy. In addition, the measurement range can be changed simply by replacing one probe with another. The user has a choice of measurement ranges up to 20 % CO2 the Vaisala CARBOCAP Carbon Dioxide Module GMM221 for higher and the Vaisala CARBOCAP Carbon Dioxide Module GMM222 for lower concentrations of CO2. Different power supply voltages, output options, as well as cable lengths, connectors, and mounting gear are also available. The Vaisala CARBOCAP Carbon Dioxide Probe GMP231 is designed to provide incubator manufacturers with accurate and reliable carbon dioxide measurements and sterilization durability at high temperatures. The probe is based on Vaisala's patented CARBOCAP technology and a new type of infrared (IR) light source. These technologies allow for sterilization temperatures of up to 180 DegreeC, enabling easier and more complete sterilization without the risk of cross contamination. The probe is installed through the incubator wall, ensuring that only the IR sensor and optical components are exposed to the incubation environment. This allows the incubator to be sterilized with the probe in place, removing the need to decontaminate the probe separately. This saves time and reduces the risk of contamination. The probe's sensor performance is optimized at 5 % CO2 but the sensor measures CO2 up to 20 % with high accuracy. In addition, the GMP231 can measure pressure and temperature for CO2 measurement compensation purposes, ensuring the product remains stable and accurate in all CO2 incubation conditions. The sensor is made of highly durable materials to achieve outstanding stability over both time and temperature. Since water vapour, dust, and most chemicals do not affect measurements, the GMP231 module is ideal for CO2 incubator environments. The Vaisala GMW90 Series CARBOCAP® Carbon Dioxide, Temperature, and Humidity Transmitters are based on new measurement technology for even more reliable and stable readings yet than used to. These wall-mounted transmitters are easy to install and have very low maintenance requirements. Designed for demand controlled ventilation, these transmitters measure carbon dioxide and temperature, with the option for humidity measurements. The instruments come with a calibration certificate that meets traceability and compliance requirements. The GMW90 Series Transmitters use advanced Micro-Electro-Mechanical System (MEMS) technology for measuring carbon dioxide. The CARBOCAP® carbon dioxide sensor's continuous reference measurement enables reliable and accurate readings and outstanding long-term stability also in buildings with round-the-clock occupancy. The new generation CARBOCAP® sensor no longer uses an incandescent light bulb, which limits sensor lifetime. This unique sensor consumes very little power compared to other sensors on the market. As a result, instrument self-heating is low and humidity and temperature can be measured correctly. GMW90 Series Transmitters have been designed for quick and easy installation and maintenance. Every model includes a display for easy startup and convenient maintenance. To protect the sensor from dust and dirt during construction and installation, the units can be cabled with back-plate only. Electronics can be snapped on later at an appropriate phase in the construction project. Dip switches make it quick and easy to configure the transmitters. Regular instrument maintenance guarantees a long product lifetime. Calibration is easiest done with the exchangeable measurement modules. Sensor traceability and measurement quality is easily maintained by snapping on a new module calibrated at Vaisala factory. The instrument can also be calibrated using a hand-held meter or reference gas bottle. The service interfaces are easy to reach by simply sliding the cover down. The closed cover keeps the measurement environment stable during calibration and ensures a top-quality final result. The Vaisala CARBOCAP® Carbon Dioxide Transmitter Series GMT220 is designed to measure carbon dioxide in harsh and humid environments. The housing is dust- and waterproof to IP65 standards. 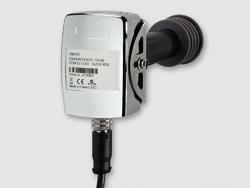 The GMT220 series transmitters incorporate the advanced Vaisala CARBOCAP® Sensor. The patented sensor has unique reference measurement capabilities. Its critical parts are made of silicon; this gives the sensor outstanding stability over both time and temperature. By lengthening the calibration intervals, the user saves both time and money. The user has a choice of measurement ranges up to 20% of CO2. The GMT221 is for higher concentrations of CO2 and the GMT222 for lower concentrations of CO2. The GMT220 probes are interchangeable. They can be removed and reattached or replaced at any time – without the need for calibration and adjustment. The probes can be attached directly to the transmitter body or, when used with a cable, installed remotely into hard-to-reach places or areas with dangerously high levels of CO2. The interchangeability of the GMT220 transmitter’s probes truly facilitates field maintenance. The end user can carry out field maintenance without any additional equipment or heavy and expensive calibration gas bottles by simply replacing a probe. Probes that have been replaced can be sent to Vaisala for recalibration. 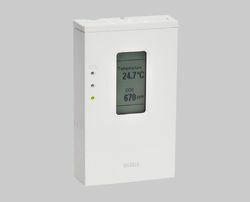 The duct mounted Vaisala CARBOCAP® Carbon Dioxide Transmitter Series GMD20 and wall mounted GMW20 are specially designed for Demand Controlled Ventilation (DCV). They are easy to install and require no maintenance. The recommended calibration interval is five years. The GMD/W20 Series Transmitters use the silicon-based Vaisala CARBOCAP® Sensor. The simple structure and reference measurement capabilities make this Single-Beam, Dual- Wavelength NDIR sensor extremely stable and reliable. The temperature and flow dependences of the sensor are negligible. In addition, the measurement accuracy is not affected by dust, water vapor and most chemicals. The GMD/W20 series transmitters can be used independently, or incorporated into building energy management systems. The series consists of duct mount units GMD20/D and wall mount units GMW21/D and GMW22/D. Version D has a display. The two sizes in the wall-mount series make them easy to install for most standard junction boxes. The duct units' compact sensor head design requires only a small hole in a ventilation duct, thereby minimizing the risk of leaking gaskets and measurement errors. In addition to the standard 0 ... 20 mA, 4 ... 20 mA and 0 ... 10 V outputs, there are three other options: two LonWorks® interfaces and a relay output. The relay output is standard with the display units. The use of the GMD/W20 series transmitters ensures the best possible control of air quality and results in considerable savings in energy consumption, maintenance and recalibration costs. The GMA20T temperature module, an option with the GMW21 wall mount unit, combines both CO2 and temperature measurement into one transmitter. The GMA20T has an output of 0 ... 10 V corresponding to a temperature range of 0 ... +50 °C (+32 ... +122 °F).